Fernando Henrique Cardoso was the 34th president of Brazil from 1995 to 2003 and prior to that served as a member of Brazil’s federal senate, as foreign affairs minister, and as finance minister. 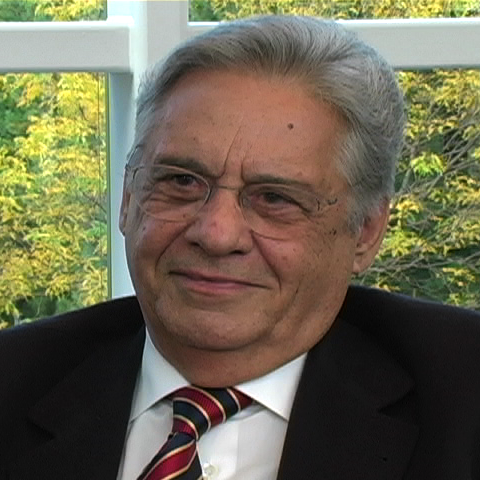 Professor Cardoso received his PhD in sociology from the University of São Paulo. His areas of interest include analysis of large-scale social change, international development, dependency, democracy, and state reform. His best-known works in English include Dependency and Development in Latin America (University of California Press, 1979) and Charting a New Course: The Politics of Globalization and Social Reform (Rowman & Littlefield, 2001). What do you think about the Nuclear Non-Proliferation Treaty (NPT)? Why did Brazil end its nuclear weapons program? How would you compare the racial dynamics of Brazil to those of the United States? How does China’s rapid economic growth affect Brazil? What do you think about multilateral trade agreements? How do international agreements on climate change affect Brazil? How does development affect the environment in Brazil? What are the biggest challenges facing Brazil today? What were the primary goals of your administration? Why has Brazil struggled with democracy?